Straddling the bridge between the Northeast and the South, as well as the East and the Midwest, Pennsylvania is at a geographic crossroads which defined much of its history and culture. The Appalachian Mountains cut through the center of the state, which itself is sparsely populated compared to the extreme eastern and western borders. 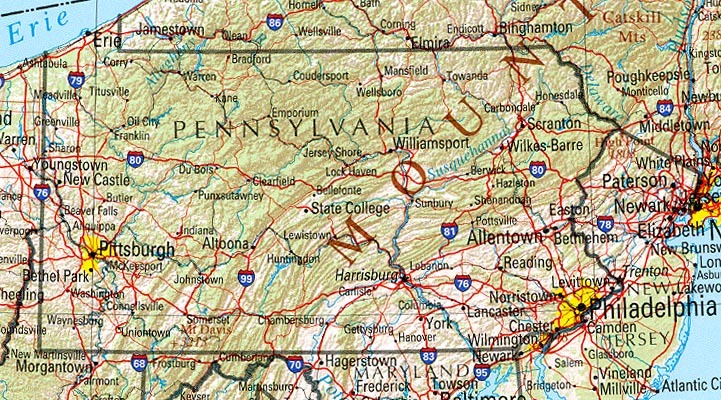 This divide in the middle creates two distinct regions in Pennsylvania, as much of the river systems in the west flow to the Mississippi drainage system, whereas much of the eastern rivers flow into the Atlantic seaboard. In the extreme northwest, the state is bordered by Lake Erie. Major river systems include the Ohio, Delaware, Allegheny and Susquehanna rivers. Pennsylvania is one of the most historic states in the nation, with Philadelphia being home to the Declaration of Independence, the Articles of Confederation and the U.S. Constitution. Not long after Swedish and Dutch settlements in the area, Britain granted a land charter to the Quaker William Penn for the establishment of a colony founded on religious freedom. By the 1700's, a large wave of German immigrants began to settle in the region. 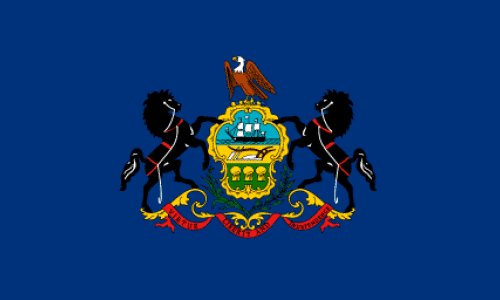 On the 12th of December, 1787, Pennsylvania became the second state to join the Union. The state was also the site of the turning point in the Civil War, the Battle of Gettysburg, which was fought in the south-central part of the state near the town of Gettysburg. The culture and demographic make-up of Eastern Pennsylvania, with the major city being Philadelphia, is quite distinct from Western Pennsylvania, centered around the historic steel city of Pittsburgh. In the central part of the state lies the capital Harrisburg, the famous chocolate town of Hershey, and further to the south, the Pennsylvania Dutch region with some of the largest Amish and Mennonite communities in the world. Pennsylvania has the 6th largest gross state product in the U.S., just below Illinois and above Ohio. The Keystone State is also the 6th most populous state in the Union. Just over 25% of Pennsylvanians claim German ancestry, while Asian and Hispanic communities within the state represent some of the fastest growing minority populations in the U.S. The economy of Pennsylvania is diversified and unsurprisingly divided between the Eastern and Western halves of the state. The Philadelphia area is known as a banking and finance center, home to the East Coast U.S. Mint, and the Federal Reserve. Manufacturing also plays an important role in the city, though further north, in particular Allentown and Bethlehem, are notable steel areas. Western Pennsylvania has a decidedly Midwestern feel, where heavy manufacturing once boomed. Pittsburgh, dubbed the 'Steel City', went through decades of decline after the fall of heavy U.S. manufacturing, but is currently going through a revival. Also known as the 'City of Three Rivers', Pittsburgh has more bridges than any other city in the world. Pennsylvania is an important swing state in elections, though the Democratic Party has managed to win the state's 21 electoral votes in the last four Presidential elections. 10th September 2008	 One of my friends reminded me recently that PA ranks lowest in number of folks who relocate to other states. How can I find out if this is true?